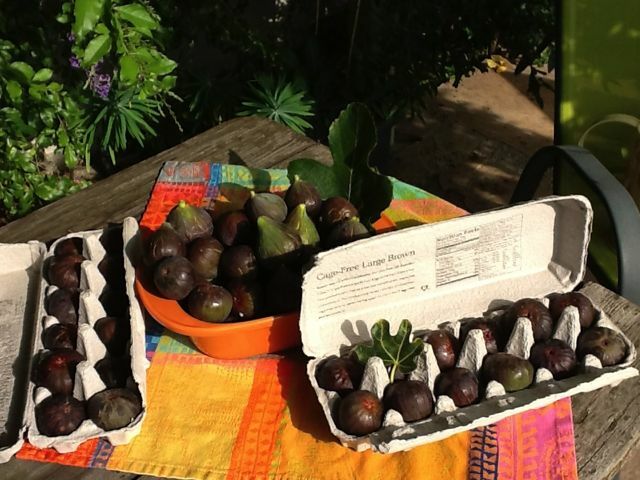 MISSION figs from the front yard…local and seasonal! this summer we’ve been blessed with a bounty of “mission” figs and the harvests have been substantial (see photo above). domenica has created several healthy and simple recipes using the fresh figs: fig/olive/caper tapenade (excellent with goat cheese); dehydrated fig/almond snack bars; figs roasted with balsamic vinegar; and a fig/rosemary focaccia also using some spent home brewing beer grain. this is in addition to the fruit compotes and hundreds of figs we ate while picking. i experimented with various fillings for the tree ripened figs: manchego, goat gouda, gorgonzola, prosciutto, walnuts, pistachios, sage, thyme… in different configurations, then simply broiled the treats until the cheeses had melted, nuts toasted and prosciutto crisped. there’s a certain alchemy between the sweet fig, pungent cheese and salty ham that is irresistible. we also discovered the PERFECT container (recycled) for transporting the ripe and delicate fruit: egg cartons! several friends and neighbors received an egg carton filled with figs this summer. fresh and free fruit is always a welcome gift, don’t you agree? sad to say, as with most lovely things and experiences, the figs are coming to the end of their season. if it’s any consolation, the vibrant dahlias are gracing our front yard, our mango tree is drooping from too much fruit and our pomegranates (on 4 trees!) are turning redder by the day. time to start thinking about autumn, i suppose. actually, though, the saddest part of summer coming to an end in five weeks (not that we’re counting) is domenica’s return to CAL POLY, san luis obispo. we’ve enjoyed a fantastic summer of family outings, coffee dates, seasonally inspired and leisurely dinners, interesting chats and relaxed evenings. there is nothing like having a younger, adventurous, energetic, creative, hardworking and thoughtful person permeating your household…even if it is temporary. however, she is off to beautiful SLO and very excited about her new rental cottage…complete with a patio for barbecues/lounging… and a yard for growing herbs and vegetables. as my dear friend, bruce stephens, recently wrote to me, “be grateful for every day.” we should all heed his sage advice. i hope this message finds you healthy, happy and enjoying the season.